Description of "Winter, Shadows and Poems"
This book is collection of poems I wrote when I was a teenager. It describes the various situations a young boy goes through, his mood swings when he meets different types of people every day and his way of understanding the world. The book will take you back to your old days recalling your first love, your separation and all your fantasies. I have been writing poems and short stories since the last eight years. I have never been formally trained in this field, I have tried to write down words that describes my feelings. I have written on topics like love, dreams, separation and fantasies. This is my very first publication. I am a computer student pursuing my graduation. 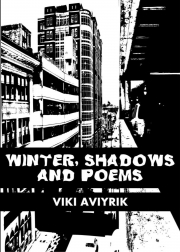 Reviews of "Winter, Shadows and Poems"